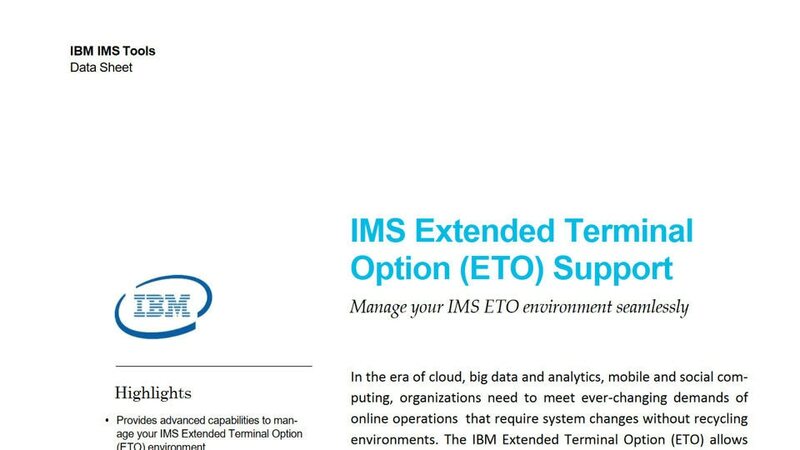 IBM® IMS™ Extended Terminal Option (ETO) Support for z/OS® enables VTAM terminals to log onto IMS Transactional Manager (IMS TM) – even if they are not defined during the IMS system definition process. Without IMS ETO Support, adding, deleting, or changing terminals that are defined to IMS TM requires you to terminate your online system to incorporate the changes. IMS ETO Support allows you to manage all of your IMS ETO settings, set global options and override options for specific users and terminals. For instance, you can set global options for the entire user community and override options for specific terminals or user IDs. Reduces the scheduled down time that is associated with adding or deleting VTAM terminals. Users can now establish an IMS session from any VTAM terminal in the network. Relate output messages to users, rather than to terminals. Reduce the number of macros required to define the terminal network – decreasing system definition time and storage requirements. For ETO terminals and user structures, resources are not allocated until they are actually required. And when they are no longer required, they are deleted. Fewer skilled system programmer resources are required to maintain static terminal definitions.